Things have been crazy busy lately, which is why I have not posted any new blog entries for a while. Not only am I hip deep in several book projects I also went back to work as a floral designer. A job opportunity fell in my lap a few weeks ago- about 24 hours after I had worked a prosperity spell… and sometimes when the Goddess steps in and intervenes, you say “Thank you.” And dive into the opportunity. I have not worked outside of the home for six years, and its been an adjustment. But the extra paycheck will really help us out. Writing, reasearch, editing and doing your own publicity, setting up author events and so forth is a full time job. Add 20-30 hours of working outside the home and things are going to be hectic until I get used to the new routine. On top of that I started my own little Garden Witch Online-store on my website. We began with a series of online classes- and then this past summer we began selling our handmade Garden Witch Pentacles, and those have taken off. The pentacles are sold to individuals online through my website-- and now they are even sold in various witchy retail shops. In Florida they are in the “Practical Magick” store, in New Orleans at the “Witchy Living” store , and of course in Salem, Massachusetts you will find them at “Pyramid Books”. Then one day, I got the idea to make witchy charm bracelets. I have a friend Joyce, and she designs jewelry for another author based on that author’s best-selling fictional books. One day we got to talking and the next thing you know we were both plotting out a few pieces of magickal jewelry based on my witchery books. And so a line of “Garden Witch Jewelry” was conjured up! Wearing charms as jewelry is not a new fad… it is actually an ancient practice. The Egyptians wore various trinkets and charms for magickal use, as well as to connect them to their deities. So did the ancient Greeks and Romans. Medieval knights wore charms into battle for protection and even Queen Victoria wore a charm bracelet- and made this jewelry all the rage with the aristocracy, back in the day. In the 1950’s and 1960’s American teenagers collected charms and added them to bracelets to record special events in their lives. If you grew up in the 1970’s and 1980’s it’s a good bet that your mother started you with a charm bracelet. Mine did. And I of course started one for my daughter as well. Classically the term charm is defined as: something worn or carried on one’s person for its magickal effect. The word charm also means: 1.) To compel with a magickal force. 2.) The chanting of a magickal word or verse; incantation. While a charm bracelet is defined as: the practice of wearing charms to ward off negativity and bad luck. An amulet. With that in mind, my friend sent me photos of various magickal charms and I chose the ones I liked the best, and then I decided which charms would go where on each bracelet. It was important to me to have a pentagram on each bracelet and a representation of both the God and the Goddess. I also asked for green glass leaves for one bracelet and then the jewelry designer came up with Swarovski crystals to add sparkle to the second bracelet. So we designed these together! Here the two designs plus their descriptions just below. 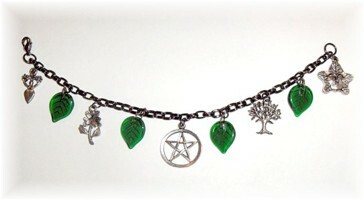 Description: Gunmetal charm bracelet with lobster clasp and five pewter charms, the Goddess of Nature, a flower, a pentagram, the Tree of Life, and a Green man. Each charm is separated by a delicate green glass leaf. Standard 7 ½” size. 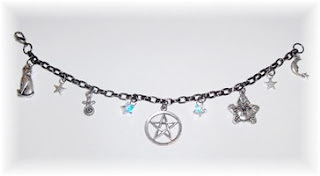 Description: Gunmetal charm bracelet with lobster clasp and five pewter charms, a cat, the Moon Goddess, a pentagram, a Green man, and a crescent moon/ star. Each charm is separated by a either a single pewter star or Swarovski crystal star. Standard 7 ½” size. You can order the bracelets on my website at www.ellendugan.com Please note that shipping for the jewelry is available only in the United States. 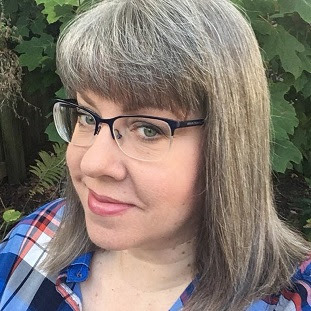 While you are there, please check out the six different and affordable online classes that I offer, as well as the very popular Garden Witch Pentacles that my husband and I make together. Here they are pictured just to the left. There are four designs of Pentacles. The Five Elements, Autumn Leaves, The Red Rose and Morning Glories. 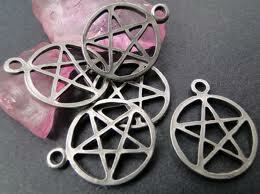 Also Joyce, at The Cotton Thistle, is hard at work designing up coordinating pentacle neckalces for us as well. The new necklaces should be available within the next few weeks. If you like, you may work the jewelry charm from my book “Book of Witchery” and enchant your new charm bracelet. The specific spell is found on page 135. So, go ahead and order a Garden Witch Pentacle or a new magickal “charm bracelet” of your very own, or as a gift for your friends. These would make lovely Samhain or Yule gifts, or even as a memento of an initiation, or on attaining a new degree within your coven. You’ll be charmed with these witchy items, I’m sure! Those bracelets are great! Can't wait for the necklaces too! Love the pentacles too !! Have a magical day and good luck with your new job and shop.